Val d'Isère is one of the most famous ski resorts in the world, and shares the huge Espace Killy domain with neighbouring Tignes. With world class lift infrastructure and a vast array of apres ski activity, 'Val' is very popular with the British, and hosts regular FIS World Cup events. The next notable snow forecast for Val d'Isère is 20cm8in, expected on 24 April, with around 54cm21in forecast over the next 7 days. How High is Val d'Isère? The French Ski Resort of Val d'Isère is part of the Espace Killy ski area with access to 300km186 miles of downhill skiing, with 154 marked pistes, served by a total of 87 ski lifts. In addition to the skiing in Val d'Isère itself (150km93 miles of pisted ski runs), the appropriate ski Lift Pass will allow you to ski or snowboard in the other Espace Killy ski resort of Tignes. The ski resort itself is at 1,850m6,070ft, so skiing or boarding back to the resort is usually possible. With ski lifts as high as 3,450m11,319ft, skiing and snowboarding is assured throughout the season. The longest possible descent in Val d'Isère is 10km6 miles long and the most difficult run is the 'La Face'. The Espace Killy, the name of the ski region which Val d'Isère shares with Tignes, is huge, with over 10,000 hectares of snow fields. As you would expect, this means there is plenty for all levels of skier. Val d'Isère hosts the first European downhill race in the annual World Cup each December, using the OK piste. Beginners have all they need to progress rapidly, including free lifts in the resort's nursery slopes area and a choice of over 500 ski school instructors to help them on their way. A novice's only risk is of being daunted by the huge terrain around them. First steps up the mountain are normally taken on the Solaise plateau, immediately above the resort. 'Val' should be on the World Top 10 list of any expert skier. The Solaise bumps run above the resort or the Olympic Men's Downhill from Bellevarde (a good first choice as it gets the sun early and accessed by the high speed underground 'Funival' funicular) are just a couple of examples. Off-piste there are numerous potential powder fields (take a Guide! ), steeps and forest runs (again, guides are essential if you're unfamiliar with the area - Val has plenty of cliffs). Descents from the Pissaillas glacier or the Tour de Charvet basin runs are equally recommended. As you would expect from a 'with it' resort, snowboarding and Val d'Isère have been friends for a long time. There's a lot to satisfy boarders of all levels in the Espace Killy where kids as young as 14 and 15 can be seen happily turning 360s in the terrain park. The Snowpark is one of the world's largest at 35,000 square metres and include two boardercross courses, a half pipe, quarter pipes, bumps, big air, tables and all with music. There's even a chalet for repairs. Boarders looking to improve their technique have a huge choice of public and independent tuition options, including the Billabong Snowboard School which specializes in off-piste. Year round boarding is possible on the neighboring glacier at Tignes with summer 'boarding on Val's own glacier in mid-summer. You can even go to the trampolining school, on a snowboard, in the summer. When is Val d'Isère open? We don't currently have confirmed season dates for Val d'Isère. Usual opening is late November (Re-opens for summer skiing from early June to early July), and usual closing is Early May. 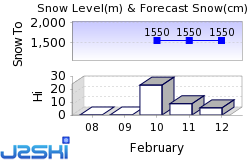 NOTE:- Lift and Piste openings are always subject to Snow Conditions in Val d'Isère. Val d'Isère is able to make snow, on 30km19 miles of ski runs, with 300 snow cannons. The 87 ski lifts of Val d'Isère are able to uplift 64,480 skiers and snowboarders every hour. Val d'Isère is in the French Alps in Espace Killy, Savoie, France. The nearest airports to Val d'Isère are Chambery, Turin Caselle and Annecy. There are seven airports within three hours drive. Val d'Isère has a 50 / 50 split of clientele between domestic and international, but half of the international market is British, making a sizable impact on the après ski atmosphere. There are numerous pubs, bars and various nightclubs. Restaurants cover the range from moderately-priced traditional Savoyarde, up to prestigious dining (with prices to match). Cultural events are staged throughout the season, including concerts at the resort's church whilst music festivals are staged at the Centre Henri Oreiller. The 'red train' a series of over 20 shuttle buses circling the various key sections of Val d'Isère runs until midnight. One hundred years ago, this was just a small hamlet at the valley head, served by a rough mule track. The farms about the area lay dormant for up to 8 months of the year because of the snow. It all changed in the early 1930s when Parisian industrialist Jacques Mouflier persuaded the local mayor to work to turn Val d'Isère in to a ski resort. The rest, as they say, is history. The local farmers trained as ski school instructors, a ski shop opened, the authorities brought running water and electricity to the village and six years later the first ski lift was installed. Today the resort, which then had just four hotels, can cater for around 30,000 overnight guests, staying in the resort centre or in one of the satellite accommodation complexes of Le Fornet or La Daille. Rapid development in the 1950s and 1960s led to the construction of some rather ugly concrete buildings, but in recent years the resort has worked hard to use local materials and architectural styles to make it far more attractive. In 2004 the resort won the rights to host the Alpine Ski World Championships, making it only the third resort in history to host all three events - and the only resort in the modern era to do so. Other Ski Areas within Espace Killy. Other popular Ski Areas near Val d'Isère. Common questions about Val d'Isère. Want to ask about skiing and snowboarding in Val d'Isère? Or contact Val d'Isère Tourist Office. 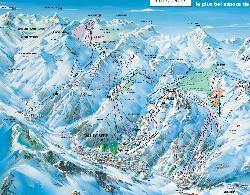 Note :- The information on J2Ski concerning Val d'Isère, where not clearly factual, is opinion only and is neither definitive or exhaustive.